Minimal losses to gold leaf finish. Wear consistent with age and use. Nice old forged iron. New back plate, finished to match iron arms, attached to comply with UL Standard. New-wired for use within the USA. 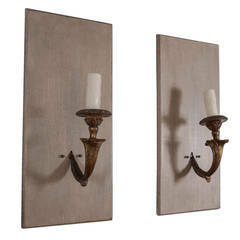 Pair of 19th century giltwood single arm sconces applied to painted antique wooden panels and newly wired. 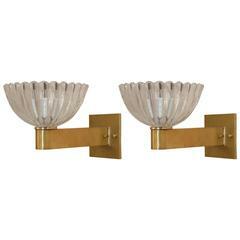 French gilt leaf sconce, ready for installation.